At South Coast Windows, we offer professional UPVC roofline replacement services at affordable prices throughout Sussex. We are leading experts in roofline replacements and can help ensure a weather tight roofline that is watertight, secure, and durable all year round. A roofline is the term used to describe the roof of your property. It encompasses 5 significant features: the fascia, soffit, bargeboard, guttering, and capping board. Weprovide high-quality and durable roofline replacements. So, if you suspect your roofline is damaged or you can see signs of wear and tear, it is important to act quickly. Without soffits and fascia’s, your home would be prone to numerous issues. At South Coast Windows we pride ourselves in supplying high-quality roofing products and solutions for all our customers. Ensuring your new soffit and fascia are professionally installed correctly prevents problems down the road. Fascia’s are perhaps one of the most underrated features of your home’s roofline. A UPVC board, the purpose of a fascia is to cover the ends of roof rafters, fittings, and to keep roofline tiles in place. Fascia’s act as a barrier between the ever-changing weather and the edge of your property’s roof. Fascia’s bear the brunt of the weather and help protect both the roof and the interior of your home from any damage. Fascia’s are the most visible part of your roofline design, so are designed with both function and aesthetics in mind. Made to enhance the overall look of your property, fascias provide both a cosmetic and a practical solution to your property’s architecture. Found on the underside of the fascia board of your roofline, soffits are visible from the ground. The word ‘soffit’ is derived from the French language, literally meaning ‘something fixed underneath’. And that’s what it is. A soffit is the material that covers your eaves. Without it, your property’s beams would be fully exposed to the weather and susceptible to mould and rot. Not only do soffits enhance the overall aesthetics of your property’s roofline, but they also provide function you may not have considered. What are Fascia’s and Soffits Made from? Timber: perhaps the most common type of material fascia are made from, timber fascia’s are found on many domestic property rooflines. However, timber fascia’s and soffits can be prone to rot and damp. And once this problem starts, it is very difficult to stop it from spreading. UPVC: installing UPVC fascia and soffit rooflines is one of the best ways to ensure long-lasting weatherproof protection. Not only is UPVC resilient to rot and damp, it also doesn’t require repainting and it lasts significantly longer than timber. Aluminium: another material providing long-term benefits, aluminium is a popular choice for rooflines. Ideal for numerous architectural designs and styles, aluminium fascias and soffits provide high performance, and both look great and function well. However, unlike UPVC, aluminium is prone to corrosion over time. Installing UPVC soffits and fascias is always considered the best option as it is an affordable material, easy to install, and incredibly long-lasting. This material is also very strong and can withstand the heavy weight of snow and ice better than timber. Durable, waterproof, and rot proof, UPVC is the best material choice for your soffit and fascia replacement. In a world where leisure is King, PVCu soffits and fascias will give you more time to enjoy life, as well as saving you money every year. But how much does it cost to replace soffit and fascia? Well, the cost to replace fascia and soffit depends on the size of your property and the intricacy of the work required. At South Coast Windows, we are dedicated to providing affordable services for our customers. So, to find out the cost of replacement soffits and fascias for your home, get in touch with our team today to discuss your requirements. There are many reasons why people should get their soffits and fascias replaced. You need to ensure your fascias and soffits are securely fixed in place to avoid any problems occurring further down the line. We have listed some of the common causes of damage below so that you know what to look out for and when to seek a replacement. As we’ve already mentioned, timber soffits and fascias are a common addition to many homes. However, they are far more susceptible to rot and damp than any other material. If you’ve begun noticing that your fascias and soffits are rotting, the best option is to look for a replacement. The UPVC fascias and soffits we sell are a long-lasting and reliable alternative. Easily installed and not prone to damp or rot, UPVC will last for many years to come. Freezing weather can also significantly affect the health and longevity of your soffits and fasicas. Frozen water that is trapped in the downpipes eventually causes cracks to appear and breakages to happen. Not only that, but trapped water can quickly stagnate, attracting pest infestations and causing blocked drains and foul odours. As with any part of your home that is constantly exposed to the elements, fascias and soffits can start to show signs of wear and tear over time. Very old fascias and soffits that have broken can be easily replaced and should be as soon as possible. Our team at South Coast Windows can professionally refresh the exterior of your home in no time at all. The most common cause of soffit and fascia damage is the build-up of debris brought in by nesting birds or other animals. Old or damaged soffits can attract small animals and insects through the cracks and holes, providing the perfect nesting location inside your property’s roof. These build-ups are often found in the gutters but can decompose, causing clogs which can encourage rotting debris, water back-up, and mould and damp problems. Installations and replacements of old fascias and soffits must always be carried out by an experienced professional to ensure no risk of problems. Installing replacement fascias and soffits is not a DIY job. Not only is attempting to carry out replacements yourself dangerous, but it could also expose you to asbestos in existing roof materials. So, it is important that you work with a professional to ensure that the job is completed safely and promptly to avoid any problems. Here at South Coast Windows, we provide high-quality fascia and soffit replacement, keeping your home functional and looking good all year round. Our UPVC soffit and fascia replacements require very little maintenance as they can be easily wiped clean throughout the year, instead of being repainted frequently. At South Coast Windows, we install high-quality and long-lasting UPVC fascias and soffits suitable for many different styles. 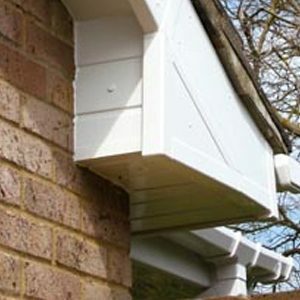 Choose from new white, woodgrain, or black fascias and soffits. Whatever your requirements, we have the replacement solution for you!